The Herschel mission, a trailblazing space observatory that provided a unique view of our cosmos during its almost four years of operations, leaves a legacy of treasured data, thousands of scientific papers, as well as a new generation of astronomers who cut their professional teeth on this remarkable endeavour. 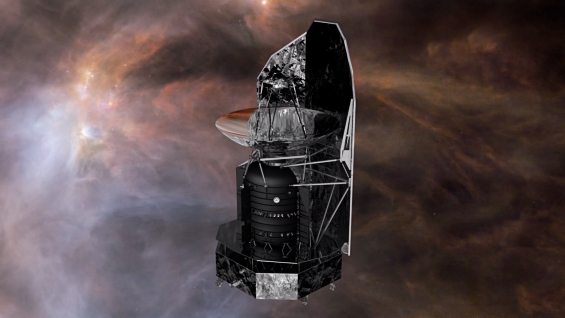 Herschel Space Observatory. Click here for details and large versions of the video. ESA's Herschel Space Observatory may have ceased its observations of the cosmos on 29 April 2013, but the intervening years have been a hive of activity as all teams involved in this great mission strove to provide the best calibrated data and new data products for the worldwide community of astronomers eager to explore new cosmic territory. Launched in 2009, Herschel was the largest infrared telescope ever built and the first space observatory to scrutinise the sky at longer, sub-millimetre wavelengths. In its relatively short lifetime, it has made important discoveries and vital contributions to almost every field in astronomy and planetary science. Although the Herschel mission has now reached retirement, the legacy of this remarkable mission carries on and it will remain a primary reference for astronomers for many years to come . Surveying the sky in far-infrared and sub-millimetre wavelengths, the observatory collected unprecedented data for approximately 26,000 hours. These are all publicly available from the Herschel Science Archive in the form of data products of various levels of processing and sophistication, from the raw observations to 'science-ready' data that have been homogeneously reduced and calibrated using standard processing pipelines; in addition, the archive also contains value-added, highly processed data products . These data products – including images, spectra, and catalogues – pertain to a total of about 37,000 science observations and 6600 science calibration observations. Over 3500 unique users have accessed them since the archive was first made available to the worldwide scientific community in 2010. Roughly two thirds of the science data have already been included at least once in the more than 2000 scientific papers published to date, which have been co-authored by approximately 4000 scientists from around the world . "Herschel can pride itself on being a very prolific observatory in ESA's space science programme, still averaging about 25 papers per month even more than four years after its final observations," says Göran Pilbratt, Herschel Project Scientist at ESA. "In fact, Herschel has become so established in astronomy that often papers only mention using 'far-infrared data', as it's obvious they are from Herschel, and astronomers now often require, when selecting samples of sources or fields in the sky for future studies, that these have already been observed with Herschel." Herschel's main discoveries speak of star formation, both in our Milky Way galaxy and in galaxies throughout cosmic history, and of key molecules – among them, water – that have made their way from interstellar clouds to burgeoning planetary systems. Interstellar filaments, which were known prior to the mission, were found in great numbers and are now, thanks to Herschel, well established as a fundamental step in the physical processes that lead to the birth of stars. The history of galaxies forming stars across the Universe has now been extended, piecing together evidence that reaches out to the first billion years after the Big Bang, and water, a fundamental ingredient for life as we know it on Earth, has been traced from the seeds of future stars and planets to our very own Solar System. But this mission has touched on a much broader range of subjects in astronomy, from the protoplanetary discs around young stars that might give rise to planets (or already host some) and the chemistry of interstellar clouds to the properties of black holes – including the supermassive ones sitting at the centre of massive galaxies like our Milky Way. In many cases, Herschel contributed the first observations ever performed of certain classes of celestial objects in this previously poorly explored portion of the electromagnetic spectrum. "Because there were no all-sky surveys at far-infrared and sub-millimetre wavelengths, in effect Herschel needed to be its own pathfinder," explains Göran. The concept of Key Programmes was introduced to handle this necessity, allocating a substantial amount of observing time – almost half of the total – to large projects dedicated to surveying the sky at these wavelengths. These observing programmes, which totally dominated the early part of the mission, were also fundamental to demonstrating the capabilities of the observatory and aided in the planning of further observations. The consortia in charge of providing Herschel's three instruments – PACS, SPIRE and HIFI – were unusually large, mirroring the level of scope and ambition of the instruments themselves. They were also entrusted with important responsibilities beyond the delivery of the instruments for flight, from the health and operations of the instruments to their calibration and the provision of software components for the processing of the data in order to make it publicly available to the astronomical community worldwide via the archive. "A space mission like Herschel is the result of a tremendous human collaboration involving hundreds of scientists and engineers, industry, and the astronomical community at large," says Pedro García-Lario, Herschel Mission Manager at ESA. "Such a large project would not have been possible without the cooperation of many institutions from across Europe and the world, each one contributing in different ways to the success of the mission, from the ESA-led Herschel Science Centre and Mission Operation Centre to the instrument consortia and the NASA Herschel Science Center. "We express our most sincere gratitude to everyone whose work has played a role in making Herschel such an extraordinary and successful mission." Many astronomers have started their scientific career with Herschel. Well over a hundred PhD theses documented to date present research related to Herschel – and likely many more are still hidden in university libraries across the world . This new generation of astronomers is now applying the skills and expertise learnt with Herschel to planning and executing astronomical observations, for example with the international Atacama Large Millimeter/submillimeter Array (ALMA), located in Chile, or in the future with the NASA/ESA/CSA James Webb Space Telescope. While Herschel has been pioneering in bridging the gap in the electromagnetic spectrum between the observations of previous infrared space missions and those performed with ground-based facilities, there is no space observatory planned for the coming decade to keep exploring these wavelengths. "This adds to what makes Herschel's scientific heritage and the data stored in its archive so important: sadly, it appears that this might be the last word for a very long while," adds Göran. "I am happy and grateful to have been involved in the fantastic endeavour we call Herschel for so many years together with so many talented and dedicated people. It is a real privilege." "Herschel has been an amazing adventure, and even though we parted ways with the satellite already four years ago, the mission's science is still going strong and will be fundamental to indicate future pathways in astronomy research," says Pedro. The largest, most powerful infrared telescope ever flown, Herschel stems from a long tradition of infrared space observatories such as the US-Dutch-British Infrared Astronomical Satellite (IRAS), ESA's Infrared Space Observatory (ISO), NASA's Submillimeter Wave Astronomy Satellite (SWAS) and Spitzer Space Telescope, the Swedish-led, international Odin satellite, and JAXA's AKARI satellite. Like its predecessors had done in the past, Herschel's discoveries have sparked great progress in the understanding of the cosmos, from the build-up of our Solar System to the formation of stars and the evolution of galaxies, but there are still many unanswered questions and, as always in science, a wealth of unanticipated questions has also emerged from the new discoveries. "These open questions are part of Herschel's legacy just as much as its discoveries," says Göran. "We are proud to pass the baton to the new generation of astronomers who will have the ambitious but challenging task of investigating beneath the tip of the iceberg probed by Herschel." Over three decades ago – even before IRAS had been launched – astronomers strongly advocated for the need to observe the sky at far-infrared and sub-millimetre wavelengths, eventually leading to the development of Herschel. This extraordinary mission has now proved beyond any doubt that this portion of the electromagnetic spectrum is fundamental for studying a broad variety of objects in the Universe, and the astronomy community is already considering how to build on Herschel's legacy to continue the next steps in this cosmic adventure. Herschel is an ESA space observatory sensitive to far-infrared and sub-millimetre wavelengths, with science instruments provided by European-led Principal Investigator consortia and with important participation from NASA. The mission, originally conceived as the Far InfraRed and Submillimetre Space Telescope (FIRST), was first formally proposed to ESA in 1982 and later approved, in 1993, as the fourth cornerstone mission in ESA's science programme. Renamed as the Herschel Space Observatory in 2000 to commemorate the 200th anniversary of the discovery of infrared light by William Herschel, it was launched on 14 May 2009 on board an Ariane 5 rocket that also carried ESA's Planck satellite into space. After the first observations performed in June 2009, Herschel continued observing the sky for almost four years, until its coolant ran out on 29 April 2013. Spacecraft operations ceased on 17 June 2013, and the mission continued in post-operations phase, during which the archive and its contents were updated and enhanced.